Jamon is back from his paternity leave, rejoining Q to co-host Episode 062 after a few months off. 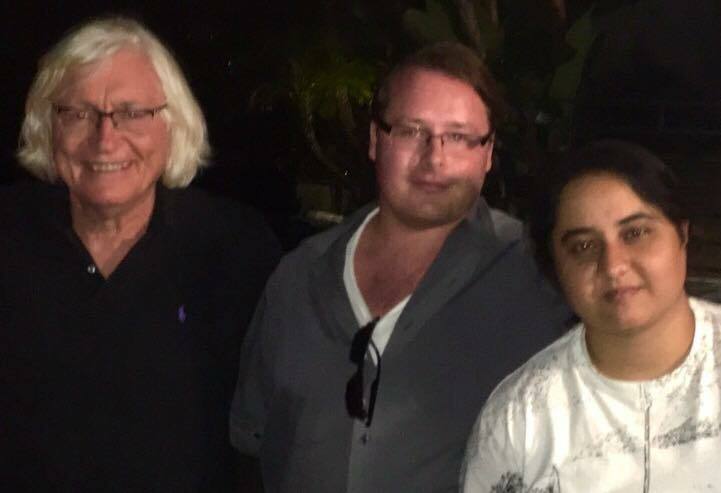 They are joined by recurring guest host and legal correspondent Charles Thomson, plus lifelong MJ fan Angela Kande. 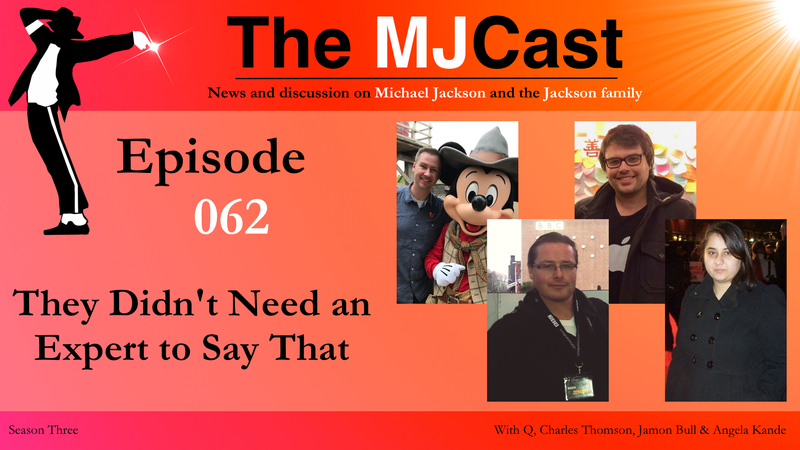 Charles and Angela discuss their recent visits to Santa Maria, Forest Lawn and the Jacksons’ 50th Anniversary Tour, before helping Jamon and Q dissect all of the latest MJ and Jackson family news. After the news, Jamon and Q first delve into Angela’s fan story, where she shares some of her most vivid memories from the ‘frontline’ of MJ fandom in the 1990s and 2000s. In addition to attending the HIStory Tour in 1997 and the World Music Awards in 2006, Angela spent time at Michael’s hotels and other places he visited during his trips to the UK. She recalls the lows (like witnessing a photographer assault Michael outside a recording studio) and the highs (like bagging a seat right behind Michael at a London theatre) of her time spent in Michael’s orbit. She also discusses the origins of her spoken word poem ‘Legacy’, about the impact of Michael’s death on his fan community. The hosts then turn their attention to Charles. Despite first appearing on the MJCast in Episode 002 and having been a frequent contributor ever since, Jamon and Q recently realised they had never asked Charles some of the key questions they usually ask guests during their first appearances on the show. What begins as a simple interview about Charles’ favourite songs, albums, videos and concerts turns into an emotional discussion about what Michael means to his fans – and the wider world – and how the fan community must fight for his legacy as his Estate allows it to crumble. This episode marks Angela’s first ‘live’ appearance on the MJCast, although she did appear as one of Charles’ interviewees in his World Music Awards 10th Anniversary Special last year. Michael’s Estate announces a one-off cartoon, ‘Michael Jackson’s Halloween’, featuring ‘reimagined’ versions of his music. A 3D version of Thriller, plus the Making of Thriller documentary, are to be shown at the Venice Film Festival. Producer Teddy Riley, a major contributor to Michael’s Dangerous album, discusses his time in the studio with Michael in a new two-and-a-half interview. Remixed by Nick* has made a large number of his Michael Jackson remixes available for download. Jimmy Safechuck’s posthumous demands for money over alleged abuse by Michael have been thrown out of court by a judge, and Wade Robson’s case looks set to follow. Quincy Jones has been awarded more than $9million by a jury after he sued the Michael Jackson Estate for underpaying him. An attempt by Frank Cascio to auction a CD of fake Michael Jackson songs for upwards of $50,000 has been called off – but the disc remains available for private sale. Jermaine Jackson performs at the grand finale of BBC talent contest Pitch Battle. Michael Jackson’s Estate has granted Sony, a company Michael despised, continued permission to control the licensing of his music. New transcripts from the class action lawsuit over the release of fake Michael Jackson songs reveal a judge has accused lawyers for Sony, MJJ Productions and the MJ Estate of throwing their co-defendants under a bus by conceding they may have been duped into selling bogus material. Michael’s son Prince has produced a music video for Swedish singer Nano. FIlmmaker Spike Lee has announced his latest Brooklyn Loves MJ street party. The Grammy Museum in Los Angeles has added new Michael Jackson exhibits to its collection. Charles previously discussed elements of his fan story in Episode 039, with fellow guest Sam Habib. Michael’s circular moonwalk on the Victory Tour. Angela Kande’s spoken word poem ‘Legacy’. Angela’s previous MJCast appearance, in Episode 44 – The World Music Awards 2006 10th Anniversary Special.